Growing up in the microbrew capital of the country (Portland, OR), I was always fond of IPAs and hoppy beers. Before my diagnosis with Celiac’s disease, I had virtually stopped drinking beer– about half of one would put me under the table. I tried my first gluten free beer about six months after going gluten-free and was thrilled to drink “beer” again. Since then, I’ve found some that I liked (Deschutes Brewery Gluten Free Golden) and some I don’t (Deschutes Gluten Free Pilsner). I typically find them refreshing, not quite the same as “real” beer, and often leaving me too “full” to want to finish a full beer. Really, I’ve been on the search for a “drinkable” gluten free beer– by which I mean I can finish the whole bottle. Also, I’ve noticed that I tend to prefer sorghum beers. 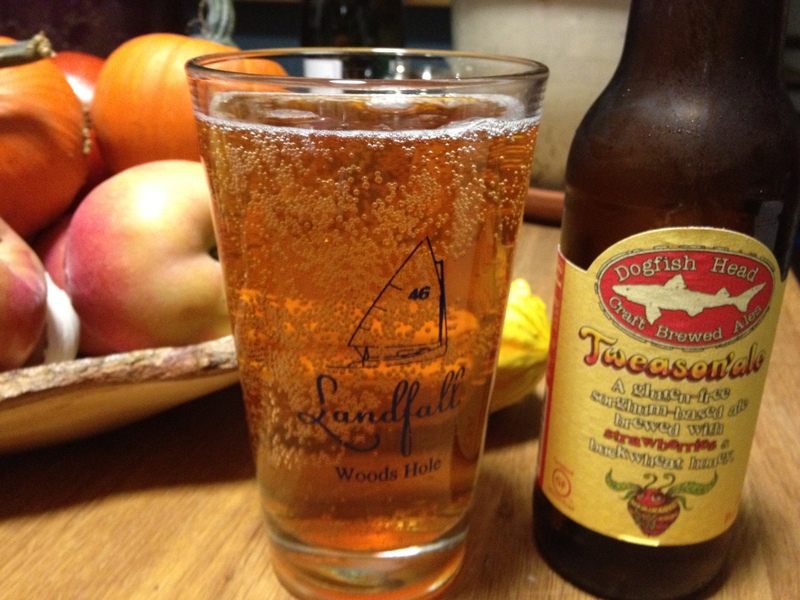 After hearing some chatter online about Dogfish Head’s gluten free beer– Tweason’ale— I decided to give it a try. Check out the company’s Fish Finder to find a retail location near you– I went to City Market in Burlington but they list 42 restaurants and retail locations within 100 miles of Burlington that have ordered it in the last 60 days. The beer– 6.0% ABV, flavors of strawberry, buckwheat and honey. Mild sorghum base. I assumed it would be fruity so I was thinkin’ “its gonna be ehhhhhhhhhhhhhhh.” Smell– robust. Taste– crisp. Finish– clean, a hint of fruit but more like a mild citrus. Not a biting aftertaste like some gluten-free beers; subtle taste of strawberry lingers. Very subtle taste of strawverry. I’ve currently got just a few sips left so I think I can safely rate it “drinkable to the last drop,” which if you’ve been following this post is a great recommendation. This entry was posted in Drinks, Grocery Stores and tagged beer, drinks on October 15, 2012 by gfvermont.